A- Pours with a beautiful puffy eggshell colored head that is about two fingers thick, and eventually settles down to a thick soapy layer over the brew. The color of the beer itself is a chill hazed copper with tinges of orange. There appears to be several lazily rising co2 columns rising, suggesting a finely tuned carbonation factor. The lacing is modest...the disappointment of this category. It starts out promising, but the foam quietly slips back into the beer, leaving behind an oily film with very small bunches of bubble staying behind. Overall a very nice looking lager! S- This has quite an intense aroma profile I have to say! First and foremost, there is a very distinct aroma of fresh hop cones, bitter, leafy and in your face! Next, there is also a big citrus smell, full of tart grapefruit, pomelo, and perhaps a hint of souring lime....there is also some Earthy pine cone aromas to top it all off. Once this has all processed through the nostrils, I do notice some sweeter malt, but not to a huge degree. The finish is crisp and clean....can't wait to taste! T- Well the flavors very much follow what my nose is telling me...first, there is a huge amount of hop bitterness that sticks on the palate straight throughout the taste! The citrus isn't as noticeable....more like getting zesty grapefruit rind instead of the fruit. Pine/cedar like flavors really are noticeable too....I don't taste too much of the malt sweetness, as there is so much else going on here! Overall this is probably the most flavorful lager beer I've had to date! M- I find this beer to have an oily feel to it....the beer is really smooth and glides down my throat rather easily. The carbonation is heavier than it looks but I feel that it needs to be there to break up the heavy bitter/tart flavors. As far as body, it's not heavy but it does have a coffee cream like thickness about it...not literally but if I had to liken it to different creams, this is where I'd put it. O- This resembles an IPA or American Amber Ale much more closely than it would a lager in my opinion. This would be wonderful with spicy ethnic dishes and yet refreshing enough to enjoy on it's own as a patio beer. With this said, I am good after having one bottle of this....it is a lot for the palate to handle without having something to go with it. The alcohol isn't noticeable at all, and while this isn't close to being my favorite beer (only b/c I am not a hop-head), I really do appreciate this lager and think it truly is excellent! I think anybody will be hard pressed to find a heavier, more flavorful lager in the beer world! Bottle: Poured a bright golden color lager with a large pure white foamy head with good retention and some good lacing. Aroma of crisp hops with dry malt notes is very enjoyable. Taste is dominated by some light floral notes with some dry hoppy notes and some solid malt with hints of sweetness. Body is full for style with good carbonation. 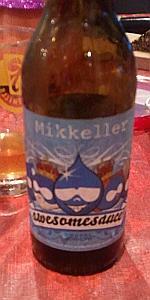 This is the type of lager I really enjoy – limited sweetness with solid dry hops notes. Now if a North American brewer could brew something similar so I don’t have to pay premium dollars everything would be fine. Picked this up at my favorite beer store in Belgium, Dranken Geers. Clear amber pour with one finger head with minimal retention and decent lacing. Lots of perfumey, citrusy hops in the nose which was surprising for a lager, but very welcome. The taste follows suit with an abundance of perfumey hops along with hints of citrus rind, pine, and caramel with a touch of resin and mandarin oranges. The mouthfeel is crisp and dry with a nice snappy hop bite on the finish. A perfectly balanced and bold lager that I could drink all day! Another winner from Mikkeller. lantern corps beer summit 2010 - day 2, oct 9/2010. zach contributed this one. thanks zach! 330ml bottle. brewed for Drupalcon Copenhagen. pours clear deep golden yellow with a big fluffy white head. the head drops fast but leaves tons of lace as it falls. aroma is good. hops! resiny pine and grapefruit. caramel. cracker and white bread. light alcohol. taste is good. resiny pine and grapefruit hops. slightly powdery, and leaning more toward the citrus side than the pine side. orange and tangerine. caramel. white bread and cracker. light alcohol. medium bitterness level. mouthfeel is good. medium body. medium carbonation level. drinkability is good. great balance. good hop depth. Slightly hazy amber colour. Creamy tan head but not great head retention. Bright citrussy aroma. Nicely earthy with a touch of pine. No real malt aroma. Looks like it'll be nice and crisp. Light and simple malt in the background which just supports a hefty hop bitterness and plenty of hop resin. Nice grapefruit character. Medium-light body with moderately-high carbonation. A really solid hoppy lager. Lots of really big hop flavour here that works quite nicely. Delightful. 330ml bottle. ½ Pint glass. Enjoyed on jul´12. Bright amber color. Cloudy appearance. Off-white, creamy crown. Good retention. Piney, resiny & citric aromas. Resiny upfront & pungent hops at first sip create a clean, sharp, bitter sensation lingering into the finish. Medium body, moderate carbonation. Oily texture. Dry astringent citric finish. Resins on the aftertaste.